Cakes & More: General Food Additives - Bangalore Home Bakers, Your Attention Please! 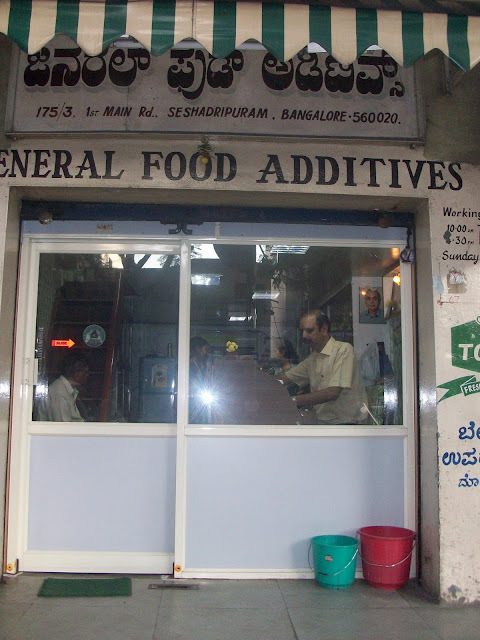 General Food Additives - Bangalore Home Bakers, Your Attention Please! General Food Additives or General Foods is this small (only in size, mind you!) 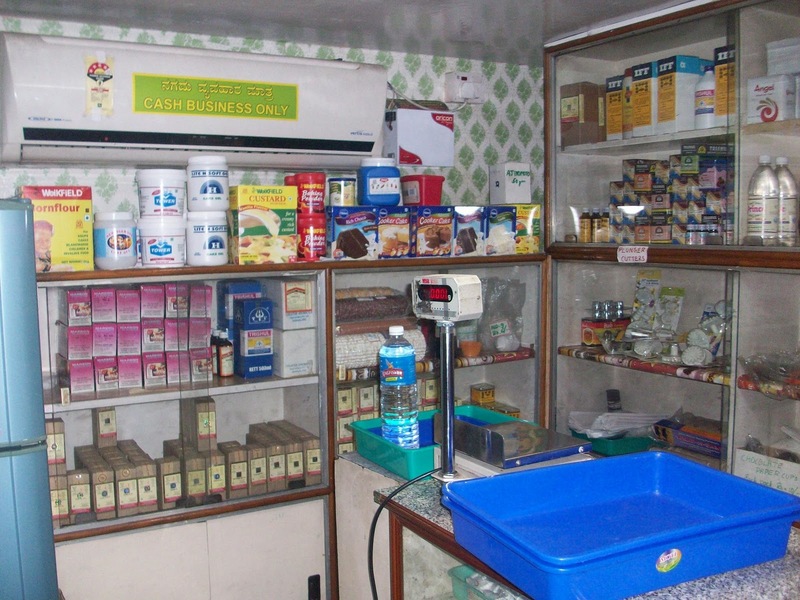 store located at Seshadripuram, Bangalore. If you have been around this blog, you would have come across this name quite frequently. Unbelievably, though I have been getting my yeast and other supplies from this shop since almost a year, I have never actually been to this shop! I have been wanting to visit this place and check out the rest of the supplies since so long. Finally, when the kids were at their grandparents' place for their holidays, I put a visit to GA on my MUST DO list. And I am glad I made this visit! I was in front of the shop at around 4.15 p.m, had 15 minutes to kill before the store opened for the second half of the business day. Since I had no company and did not see any interesting looking shops around, I was left with no choice but sit in the car, reading a book. The restless person that I am, I was out of the car in less than 5 minutes, looking for signs of people opening the shop. Finally, a person with boxes labeled Morde arrived and there ended my wait. The other two staff members seemed to arrive in perfect sync and I was let inside. I must admit, I was expecting a smelly, cluttered shop with piles of boxes all over the place like most other shops of this category. I was very pleasantly surprised to see a very neat, organized and clean place. How first impressions matter and stay! 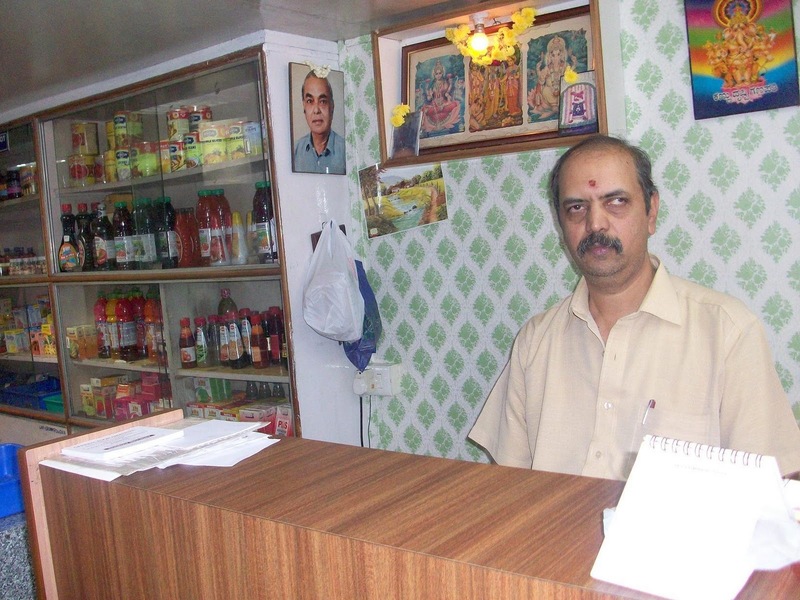 GA was founded by the proprietor Mr.Ramachandra's father, Mr. T. R Kalyan Raman in 1977. They have a wholesale division which caters to the the bakeries and bulk sales, some of the major bakeries and hotels including 5 star hotels, clients of GA. This particular store opposite the SBI ATM is the retail outlet of GA. I have earlier interacted with Mr.Ramachandra over the phone and mails, but it was indeed a pleasure meeting him in person. Well informed and interested in really listening to what his retail customers need and trying his best to meet their needs. Like researching about the components of a particular ingredient and how it works to get us a more easily available ingredient. Liquid glucose for instance, which Mr.Ramachandra says is the same as Corn Syrup. Repacking supplies hygienically in smaller packages, something we home bakers really and desperately need in a country like ours, where baking supplies are not common place. On Mr.Ramachandra's instructions, the staff let me to nose around a bit, answered my queries and allowed me to take some pictures. Here are some of their supplies for you. 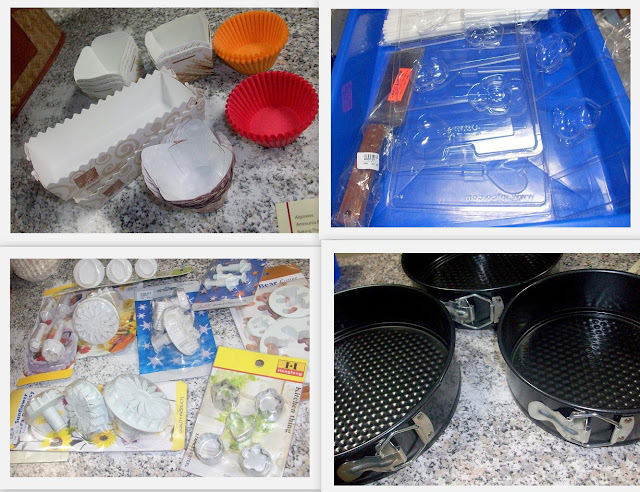 Pretty cupcake liners, mini loaf pans, cake pop sticks, chocolate molds, plunger cutters, fondant cutters, spring form tins...found that they are quite reasonably priced. Golden brown sugar - A brand called Trust, packed by the manufacturer in convenient 1 kg packs. There are more products which Mr.Ramachandra plans to introduce soon, bread mixes among them! So if you live in Bangalore or visiting Bangalore, its worthwhile to take time out to visit the store. Thanks Mr.Ramachandra, for being a ray of hope for us in this city. Sincerely appreciate your taking interest in the needs and wants of the growing tribe of baking enthusiasts. Update on 17th September 2013 Cash and cards both accepted now.GFA couriers your order now for a charge. Yes, have seen you refering to this stores in your blog. Thanks for a whole lot of information (in detail) about the shop. Suma, I must say that you are doing the biggest favor possible by sharing such vital information in a highly organised fashion. Thanks a lot for your efforts. What an incredible discovery. Thanks so much for sharing this. I am definitely visiting them next time I am in that side of the town. This is the first place where I started buying my baking staples. I find the price of baking pans and liners very reasonable compared to shivajinagar shops. Awesome ! thank you so much for this, will definitely visit the next time I am in Bangalore...Thanks again for the detailed instructions..thanks to Sayantani, who directed me to your blog, for the instant yeast recipes, ite been a dream working with gloripan ! very useful post Suma..Will go this place sometime. Wat a useful post, helpful for many bangalore living buddies..Great job Suma..
do they do home deliveries? just wondering because you've been getting supplies from them but have never actually been there :) i need to re-stock my baking supplies. so I'll probably head out to this place this weekend. Thanks so much for the info! Extremely useful article. Thoughtful list of items in stock in the store and pics too! It helps me to take my baby steps towards home baking, it helps too that I live close by to this great store! It would be great to meet up with you when you are here on your next visit to the store. OMG! I had no idea all these baking "goodies" were available in Sheshadripuram.. Your site is such a warehouse of information Suma! So glad to have stumbled through Deeba's interview link.. Very useful information indeed Suma. Thanks a lot for sharing this information. I too love baking and have been exploring quite a bit even with a hectic schedule. Recently, after knowing my son's love for Choco lava cake, I tried one at home....it's very easy and very very yummy. I wanted to try preparing puff pastries at home. So please share with us if you know any place in Bangalore which sells the Puff Pastry sheets. very very very useful post but now I miss being in Bangalore. how i have been frantically searching for gumpaste and plunger cutters. have to ask someone coming from there to get some for me. @Rajani - Sure would love to meet up! @Mamtha - Choco-lave cakes? Yumm! !You could try Gourmet Store on MG Road for puff pastry? Suma, I owe you a huge thank you. I went to this store based on your recommendation despite it being on the other side of town from me. Love the store, and the fact that they have repacked everything in convenient sizes. Got a few things today.....and am planning to visit again when I have more time. Hi Suma, Thanks much for the Info. Guess what...the first time I was looking for some baking tips google led me to your blog. the Second time when I was looking for chocolate info. I landed up here, inspite of adding you in my fav. list. Now I know I dont need to go anywhere else :) Pls. do visit my blog. I am total newbee..would love to hear from you! Thanks a lot for this post. I usually get my supplies from the Institute of Baking at Mission Rd. I would really love some other option and this seem to be something I should try out. 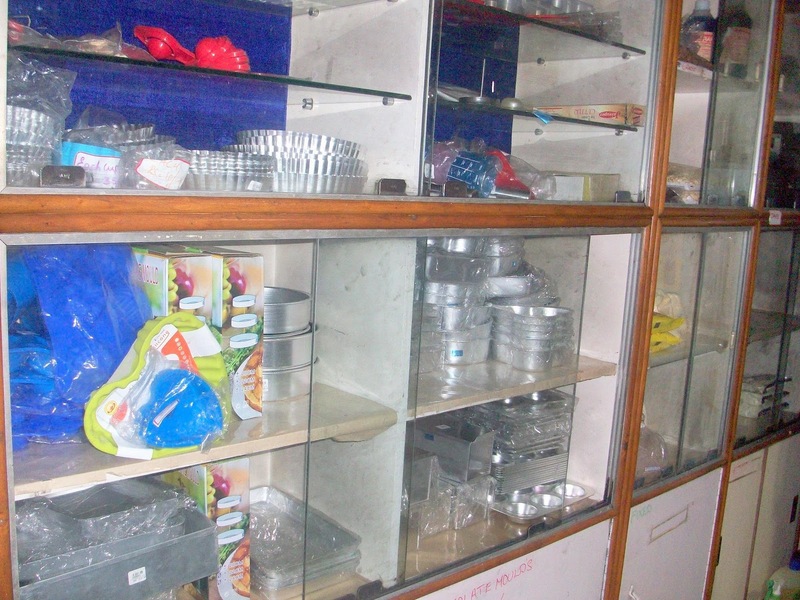 It is a chore finding baking supplies in B'lore, phew! I have been searching for suppliers for cake packaging boxes. Do you happen to know any good ones? Thanks for this excellent source, Suma! I've been getting my supplies from IBCA but it sounds like GFA has a larger variety. Thanks a lot..I had been staying in bglr for 3 years and kept searching for all these so badly and went home upset...Thank you very much. I will definitely go and buy all the raw materials. Mamatha Inamdur: you can get puff pastry from All Saints Bakery on Brigade Rd. They sell it by the Kilo. Need to order a day in advance though. You can find their number on justdial. Other than GFA there is also another whole sale shop called Baker's Needs on Oil Mill road, off Lingarajpuram Main road that has a huuuuge stock of various baking items/utensils/cake boxes/decorations/fillings/chocolate/chocolate moulds etc. His shop is not as neat as GFA but he has a lot of stuff you cant find elsewhere. The phone number of the store is: 080-41733571. I wanted to check if I get pure vanilla extract. But right now this shop does not sell it as packaging is a problem, but he asked me to contact again in feb, 2013. I shall let you know about it. hey looks like very nice shop...must visit next time..thanks suma 4 d info..thanks for sharing it.. OMG!!!!! I just came out of this store with products I hadnt even dreamed were available in Bangalore (I got cream of tartar.... yay!!!).. cant tell u how much I loved the place...... thanks so much for sharing this info!!!! Wow. What a wealth of information. Heading there asap, will also try out the place mentioned on Oil Mill Road and report. I was frantically looking for color to color my white chocolate and voila! Such an incredible discovery. I got my powder colors here along with Christmas themed chocolate transfer sheets! :) It is a neat little shop with a lot of variety. Love it! Chocolate & Coconut Granola - Crunchy And Delish!